REBOA: Ready for Prime Time? For years, the resuscitative thoracotomy has been the sole weapon in the physician’s arsenal against a loss of a perfusing pressure in the crashing trauma patient. With the advent of new endovascular technologies, novel methods to control hemorrhage are being refined, among them Resuscitative Endovascular Balloon Occlusion of the Aorta or REBOA. With this newer method getting a lot of attention in the emergency and trauma communities, it’s time to take a look at what it is, how successful it is, and where we are going with it. Is It Feasible for ER Docs to Perform? In England, there are case of REBOA being deployed in the pre-hospital setting to act as a bridging method for resuscitation during transport.7 As the relay between the hospital and Emergency Medical Services, it is an EM physician’s responsibility to be aware of this method and its utility in her area. REBOA is a newer up-and-coming method of controlling hemorrhage secondary to abdominopelvic trauma that may act as an alternative to resuscitative thoracotomy. Although more data still needs to be collected, REBOA has not yet shown to clearly improve mortality, and does come with certain risks and complications. There are more novel methods of REBOA undergoing research and development, including SAAP, ER-REBOA, and P-REBOA, which may strengthen the utility of REBOA and reduce some of the complication risks. REBOA is within an EM physician’s scope of practice, and may play a role in EMS in the future. As such, it is our duty to be aware of it and follow along with its developments. 2. Patient selection is critical! The available data generally has the inclusion/exclusion criteria listed, but definitions on who is “unstable” vary. In my opinion, an arbitrary blood pressure cutoff of <90mmHg in someone with torso hemorrhage should not automatically trigger REBOA. I think these patients should get a CFA line, and then proceed to REBOA only if not responding to initial resuscitative measures or rapidly deteriorating to imminent arrest. 3. Placement before arrest will likely lead to better outcomes. The evolving data shows that the group that benefits most in terms of mortality are the nonresponders who will imminently arrest unless they have a lifesaving procedure. In the arrested patient, as mentioned, determining the time of arrest is crucial. This can certainly be challenging with prehospital arrest. 5. It is absolutely critical that REBOA is used in a system that can rapidly deliver these patients to definitive care (OR/IR). The consequences of prolonged balloon occlusion as listed are dire. Based on collective clinical experience and translational animal data, I would not recommend occluding beyond 45 minutes to 1 hour in Zone 1. 6. REBOA in the US is currently used only at level 1 and 2 trauma centers. I think (as the British have shown), the biggest benefit is likely at smaller centers and ultimately prehospital. Success here will be based on procedural considerations (like p-REBOA to prolong safe inflation times), appropriate training, and systems issues (expedited transfer to definitive care). Joseph B, Ibraheem K, Haider AA, et al. Identifying potential utility of resuscitative endovascular balloon occlusion of the aorta: An autopsy study. J Trauma Acute Care Surg. 2016;81:S128-S132. 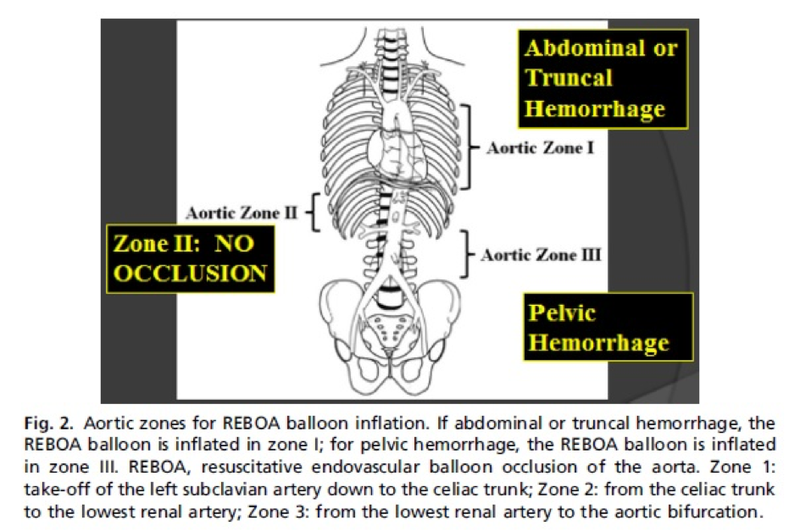 Resuscitative Endovascular Balloon Occlusion of the Aorta (REBOA). Vol 2016. LIFTL. Napolitano LM. Resuscitative Endovascular Balloon Occlusion of the Aorta: Indications, Outcomes, and Training. Crit Care Clin. 2017;33:55-70. Morrison JJ, Galgon RE, Jansen JO, Cannon JW, Rasmussen TE, Eliason JL. A systematic review of the use of resuscitative endovascular balloon occlusion of the aorta in the management of hemorrhagic shock. J Trauma Acute Care Surg. 2016;80:324-334. Perkins ZB, Lendrum RA, Brohi K. Resuscitative endovascular balloon occlusion of the aorta: promise, practice, and progress? Curr Opin Crit Care. 2016;22:563-571. Russo RM, Neff LP, Johnson MA, Williams TK. Emerging Endovascular Therapies for Non-Compressible Torso Hemorrhage. Shock. 2016;46:12-19. Bebarta V. REBOA - Ready for Prime Time? ACEP EM Education. Weingart S. Podcast 170 - the ER REBOA Catheter with Joe DuBose. Vol 2016. EMCrit Blog. :Available at [http://emcrit.org/podcasts/er-reboa]. Saito N, Matsumoto H, Yagi T, et al. Evaluation of the safety and feasibility of resuscitative endovascular balloon occlusion of the aorta. J Trauma Acute Care Surg. 2015;78:897-903; discussion 904. Posted on January 7, 2019 by NUEM Blog and filed under Trauma and tagged REBOA trauma thoracotomy.